Q: What are the right steps to begin racing? Q: What’s best to improve my driving, a driver/pro coach or pro school? Q: Will brain training apps help my track driving? Q: How close should my lap time be to the data system’s theoretical best? Q: What gears should I be using on the race track? I’ve been thinking about a comment you made about “trying one gear taller.” You mention the sound of the car can make us think we are going faster than we really are. I get that but, I’m now driving a 2007 Cayman S and it is a total “momentum” car! Q: Why do some drivers pump/tap the brakes prior to a corner? Q: “Why do some drivers pump/tap the brakes prior to a corner? I love watching footwork and how great drivers use their feet and work with their hands. I notice that some drivers tap the brake pedal on most straights. Is this just testing to make sure the brakes are still working? Q: Where do I divide up sectors when analyzing data? Q: With limited time between autocross runs, should I spend time analyzing data or do mental prep? 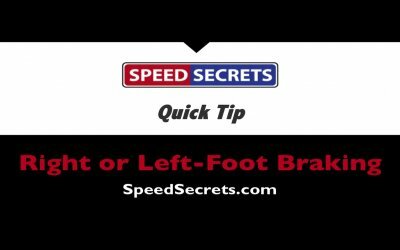 Q: When should I left-foot-brake? And where should I position my left foot? Q: How do I know I’m progressing if I have 3 different HPDE instructors telling me different things? Q: “My question to you is, how do you progress while having three different instructors in three different events. Yes, they were all helpful in their own ways, one even guided me to your books, but it is hard to track progress without any basis. My only basis to know I am progressing is becoming able to drive my car comfortably at the limit of my tires. I don’t have any information gathering devices to know track times, but I have taken videos of my events. Any advice?